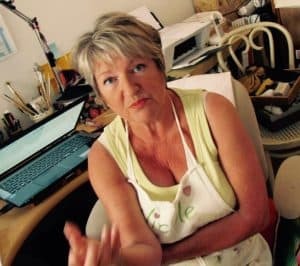 Nicola tells you about her painting holidays in France. ou how it's done, where it can be used and holding your hand every step of the way. The creative spirit within needs to be coaxed and gently nurtured to allow it to achieve marvellous things. There is great pleasure to be had in the 'doing' until, you are almost in a meditative state and the result is merely a happy ending to a fulfilling experience. Trust me to bring out the artist in you. I also have a channel on called Nicola Blakemore. Go and take a peek at some of my videos showing you tips and techniques. After time spent in both London and Paris, I returned to my creative roots, so to speak, and became involved with interior design, specialist painting effects and creating murals for clients in both the UK and overseas. I have taught at college level, with special needs and worked with private groups. Now installed in the Languedoc south west of France, I continue to create murals, specialist painting effects, teach art both in classes, on painting holidays and now via the internet. I also paint a variety of subjects to commission, including pets and houses and I am accomplished in a variety of media and styles including portraiture. There is a saying that you should' know what you are good at and stick to it', I say, 'discover what you might be even better at and go for it'. Why I think this is probably the best painting tuition you will experience, because it’s gentle and supportive. My teaching doesn’t just cover all the basic techniques budding artists will need by giving them plenty of demonstrations and learning activities, but I also approach their learning holistically. It is quite amazing when I start teaching people how to paint a number of issues concerning their creativity come to the surface. Their fears and expectations, family history and their education process, all come creeping out of the dark to be dealt with through a creative process. The creative spirit is a very tender sprouting plant, and if blighted in early life it will simply no longer feel able to flourish. Sad indeed, as the fear of just trying is greater than the belief that something beautiful can be accomplished . Many people develop ‘limiting beliefs’ in their ability simply because they were judged by an over critical teacher or parent. There have been times when this has brought up tears of realisation and joy that they actually can create something wonderful. I approach the whole teaching process as a play activity and with my very gentle and patient approach I get some very happy paintings and people. How has this come about? Simply because I am an NLP practitioner. What is NLP? Neuro-linguistic programming (NLP) is an approach to communication, personal development, and psychotherapy. So I bring these skill into a playful painting process. My tuition via the internet. I love teaching people on a painting holiday, but not everyone can get here. So with the wonders of the internet I am able to reach many more people who may not be able to get to a regular class for whatever reason. This means that my teaching style has to be very clear. At times all the student sees is my hands as I demonstrate a specific style or technique. However, my videos are filmed in such a way that the student feels they are standing next to me, looking over my shoulder.